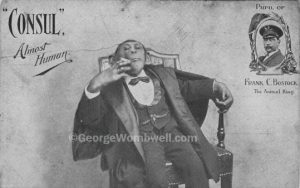 The ‘Almost Human’ Chimpanzee ‘Consul’ is shown in this postcard as a ‘pupil’ of Frank Bostock’s Jungle. However, since the original ‘Consul’ died several years before 1908, it actually shows Frank Bostock’s skills in promoting profitable acts even after their death! 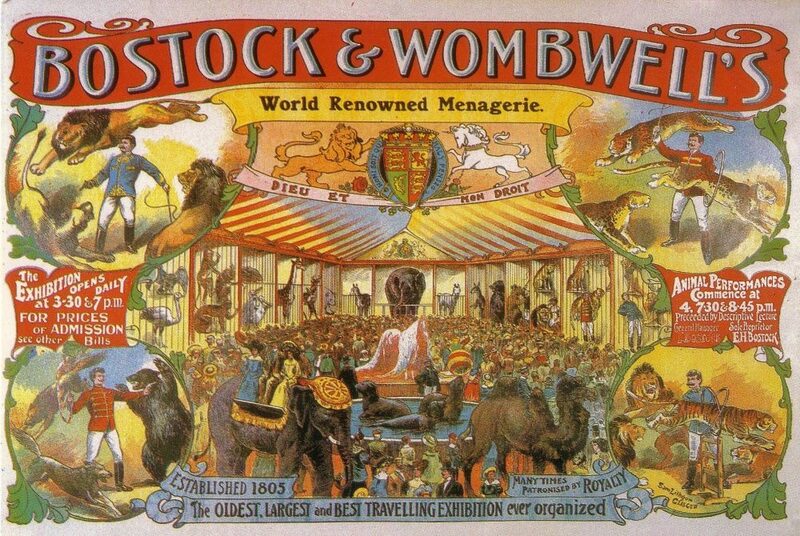 The original ‘Consul’ performed at Bostock’s Coney Island arena in New York, USA before coming to Europe to tour in 1904. He died shortly after his arrival in Europe. Bostock though, had several replacements lined up all billed as ‘Consul’! I remember London Zoo holding daily Chimpanzee tea parties. I certainly attended one (as visitor!) during the school trip around 1958. They eventually died out given the rise of the Animal Rights movement and public opinion. That did not stop PG Tips from using Chimpanzees in their advertisements well into the 1960s in Britain. This entry was posted in Frank Bostock and tagged Consul by admin. Bookmark the permalink.